Last week we took a trip to Hatton Country World to visit the Toyz World Team. Toyz World are a stockist of BeBop bouncy castles and inflatables and they wanted to show us some of their bestselling bouncy castles and to let the children loose to play with them. 64% of parents agree that kids today just don’t play outside as much as they used to53% of parents agree children are losing their sense of adventure64% of parents believe their children play outside less than they did as childrenOver 50% of children prefer to stay inside and watch TV or play on a console to going outdoors. My kids are definitely adventurous and love to go and explore parks and Castles much more than sitting in front of the telly. They don't play outside at home as much as I did as a child as I don't think I would like them off exploring the area alone like I used to but they do get a lot more adventurous days out planned than I ever did at their age. I think it is a little unfair to compare our children's outdoor experiences to ours as it definitely seemed much safer to let children wander and explore years ago. I remember spending hours on end in the local woods going home just to eat dinner. Yet back then attempted abductions/kidnappings were shocking and not a day to day occurrence and no one wants to take them risks with their precious children. 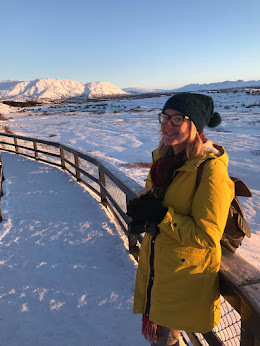 I do however think it is important to embrace their adventurous sides in different ways whether it be woodland trails, castle visits, farms or visiting the local park. Kids do still love the outdoors when they get out there you just have to make it a regular family activity and enjoy it together! Well I can certainly say I feel my children have a big sense of adventure and they sure proved it at Hatton Country World. They were excited as soon as they spotted the bouncy castles from the car park and barely stopped to take their shoes off before jumping straight in. Even Zach, who was too small to climb up to the slides, tried his hardest and a few other children tried to help give him a push! 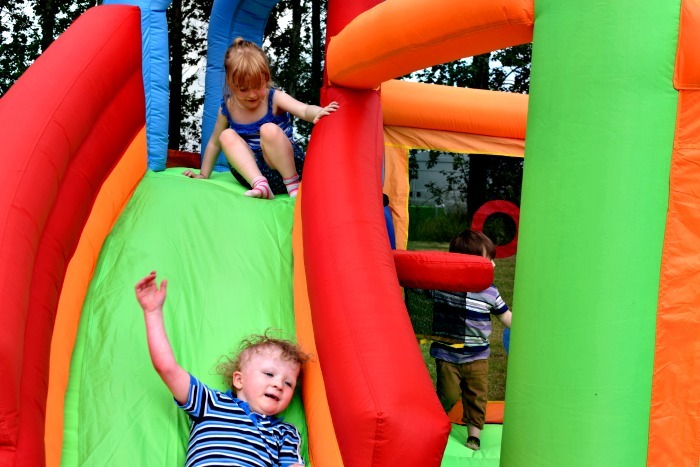 Not only do bouncy castles bring out a sense of adventure, but they get kids playing together rather than alone and the smiles and laughter is infectious. 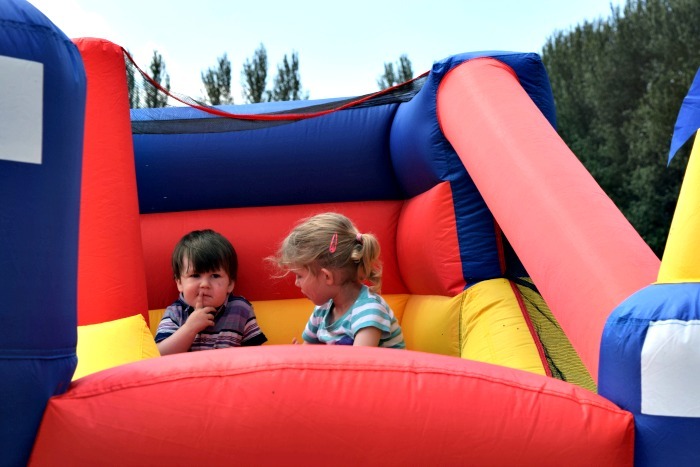 They loved the bouncy castles. There were two set up for them to play with; BeBop Fortress Airflow Bouncy Castle and BeBop Spin Combo Bouncy Castle and Water Slide after asking them both it is safe to say their favourite out of the two was the Fortress! I actually liked the Spin Combo and would have loved to see it with the water added! The kids all played together for so long before having lunch and heading into the farm. 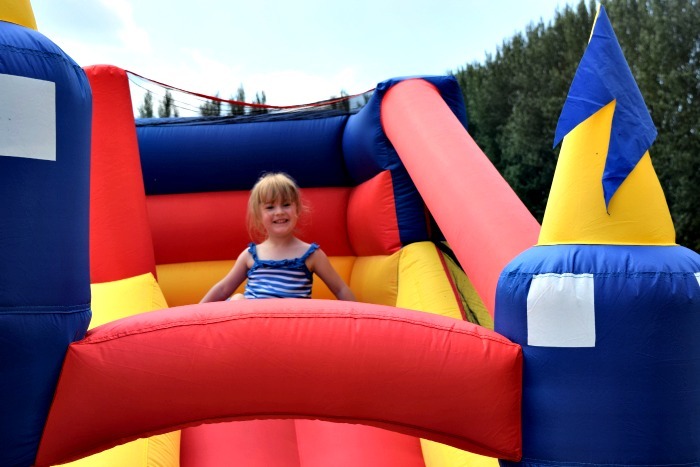 Toyz World have both Bouncy Castles available to buy over on their website along with many other bouncy castles and inflatables. 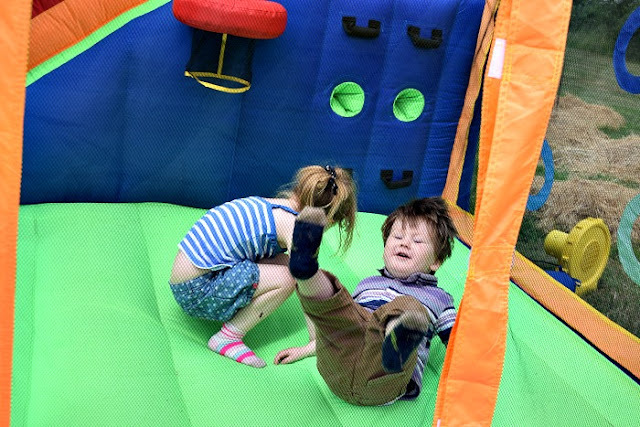 Considering what you would pay to rent a Bouncy Castle these days, they are great prices and are made from amazing quality materials (not the thin nasty stuff that needs taping over when it regularly punctures, a pet hate of mine with scruffy bouncy castles). Both of these castles are £399.95 but there are cheaper ones available on the website. I think it would be a great idea to group together with friends or family to buy one and use for all the kids birthdays! It would pay for itself after so many uses.